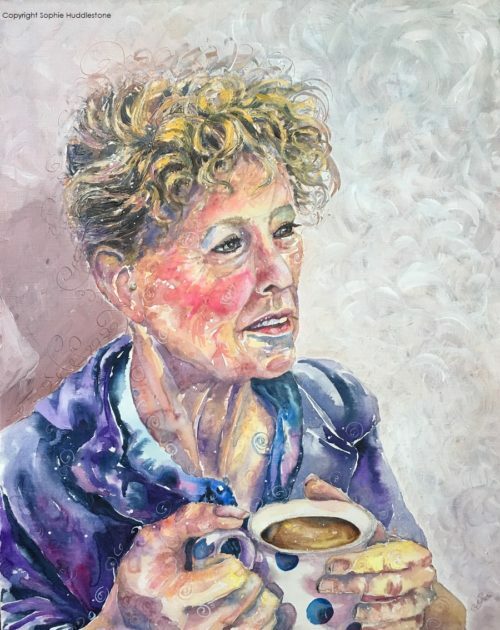 Portrait Tea Break original oil & watercolour painting on a canvas textured paper size 20″ x 16″ (508 x 405mm). Modern contemporary portrait by Sophie Huddlestone. Hand painted in artists quality watercolour paints and oil paints and a fine layer of professional satin varnish was added which also gives the artwork UV protection. Unframed and unmounted. Includes a small certificate card, signed, with purchase details, which proves the authenticity of this purchase direct from me, the Artist. The copyright wording is not across the actual artwork. Full copyright remains with the artist, Sophie Huddlestone. Posted flat in layers of cardboard. Will require a signature on arrival. The postage tracking code will be emailed to you. Copyright © 2018 - 2019 Artist Sophie Huddlestone all rights reserved. Copyright © 2011 - 2018 Artist Sophie Appleton all rights reserved. Policies https://www.sophiehuddlestone.com/policies This website has a McAfee secure certification.